The hot and dry weather on Tuesday supported active fire behavior on the Taixtsalda Hill Fire (#357) burning southeast of Tok. The fire is now estimated at 20,500 acres, an increase of 2,100 acres, according to the Alaska Division of Forestry. 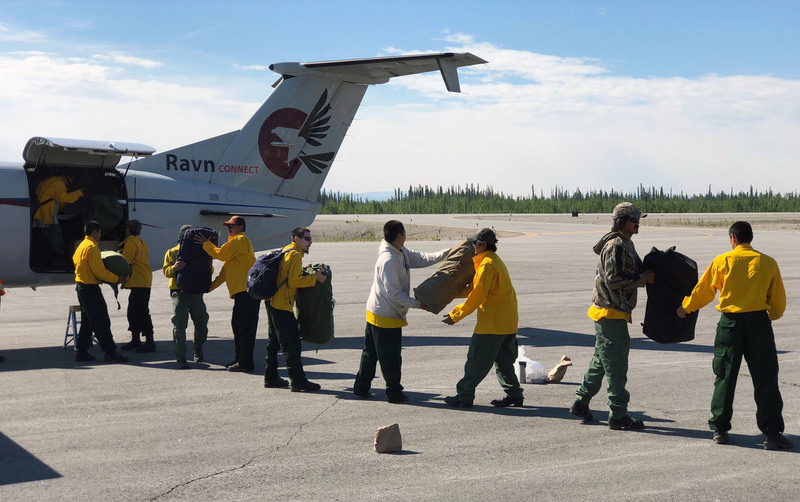 The fire, which started July 23, is burning in a remote area approximately 14 miles southwest of Northway and 38 miles southeast of Tok. It is approximately 20 miles west of the Alaska Highway. There are 158 personnel working on the fire, including five Type 2 hand crews. Operations to protect property and cabins continue in areas closest to the fire’s perimeter. Today’s weather is forecast to be hot, followed by clouds moving in from the west this afternoon along with cooler temperatures. Thunderstorms are possible today. Minimal precipitation as light rain may begin and continue for the next two days. The cooler, damper weather will slow fire growth. A structure assessment of all buildings in Northway began Tuesday as part of long-range planning and for use in future years. Structure protection measures are underway on Jatahmund Lake, 9 miles southeast of the fire. If any new wildfires start in the Tok Area fire managers will support local initial attack efforts with firefighters from the incident. The temporary flight restriction over the fire area was expanded today to provide a safe environment for firefighting aircraft to work in. There are multiple firefighting aircraft regularly flying in the area. To check on the specific coordinates of the new TFR, pilots can go to http://tfr.faa.gov/save_pages/detail_8_8698.html. Future community meetings will be scheduled when needed or if the fire burns closer to the communities.